A Ballycarry journalism lecturer, who has been teaching English in Colombia, has been recalling a terrifying ordeal which he says has left him “feeling violated”. Steven Grattan, a former pupil of Carrickfergus College, was robbed at his apartment in the capital Bogota after being drugged. 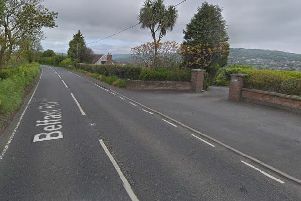 Mr. Grattan said he believes that a coffee, which he had purchased at a cafe near his home, had been “doped” with a Valium type drug, enabling the culprit to return with him to his home under the effects of the drug before stealing possessions including a laptop, camera, two phones and cash. “I assume the person had been watching my routine over a few days and knew my times and routes around the city,” said Steven. He said that once awake, some seven hours later, he managed to find an internet cafe to contact a friend. Tests at hospital revealed he had been drugged with a high level of Benzodiazepine. “This experience was truly frightening. It feels violating to know that someone took advantage of me in this way,” he added. However, he says that he has no plans to return home and his experience has “not put him off” Colombia which he has described as a “gem in Latin America”.